The lead designer of Kingdoms of Amalur: Reckoning says it's piracy, not the dominance of consoles, that makes big-budget PC exclusives impossible today. Big-budget PC exclusives are pretty much unheard of in this day and age. They do happen but they tend to be either indie affairs, low-budget niche products or Ukrainian. The reason, obviously, is the rise of the console, which drove gaming from the computer desk to the far more consumer-friendly confines of the living room. PCs are expensive and complicated, consoles are cheap and easy - it's not exactly brain surgery. But according to Kingdoms of Amalur: Reckoning Lead Designer Ian Frazier, nailing the lucrative console market isn't necessarily the biggest impediment to major PC exclusives. "No, probably not. A game this big is very expensive, to be blunt about it," he told IncGamers when asked whether a game like Kingdoms of Amalur could make it on the PC alone. "The PC, with piracy being as rampant as it is, is really hard to make money from. My first game was Titan Quest, a hack 'n' slash RPG, which was PC only, but the amount that it was pirated was the difference between us staying in business and going out of business." Frazier was a designer on Titan Quest, a Diablo-esque action-RPG created in 2006 by the now-defunct Iron Lore Entertainment. It's an excellent game and still boasts a surprisingly active community, but its launch was marred by pre-release piracy, specifically an undocumented security check that dumped players out of illegal copies of the game. That led to some very negative word-of-mouth about its buggy, unfinished state prior to launch, which turned out to be inaccurate but still hampered sales and contributed to the studio's demise. It's not impossible to do well by focusing on the PC but the bottom line is that the open nature of the system makes the risk of failure, even with a really good game, much higher. "It's really, really hard to be profitable by concentrating only on PC," he said. "Unless you're an MMO." 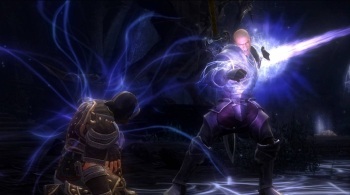 Kingdoms of Amalur: Reckoning comes out on February 7 for the Xbox 360, PlayStation 3 and PC.